"It's literally a licence to eat." Sounds like a dream, right? Not in Francis Benali's case - it's a necessity when you're soon going to be burning 10,000 calories a day. Later this month, the former Southampton full-back will undertake a mammoth challenge - seven Ironman triathlons in seven days. To spell it out, that's swimming 2.4 miles, cycling 112 miles and running a full marathon - 26.2 miles - every single day for a whole week. But why? "It's part of a fundraising mission that I set a number of years ago to raise £1m for Cancer Research UK," he tells BBC Sport. "I became intrigued by ultra-endurance events many years ago following my playing career, and I wanted to put myself in a position where I would test myself physically and mentally beyond anything I'd experienced before." It is not the first time 50-year-old Benali - who made 311 appearances for the Saints, his boyhood club - has pushed his body to the limits. In 2014, he ran to all 20 Premier League stadiums and in 2016, ran and cycled to all Premier League and Championship grounds in two weeks. This time, he will start the challenge in Manchester on 29 April, finishing in Southampton on 5 May, and it's proving as tough a challenge to fuel his body as to complete the training itself. "I'm constantly eating and drinking," he says. "That's not just junk food, but there are few treats in there. I need to eat and get the calories in so I am not losing too much weight. "I've lost a fair bit of weight but it's a real effort, to continually eat, to get the right food and fuel in your body. "There is a physical and a mental side to the challenge, but the refuelling, recovery - or lack of it - and sleep is a big thing that is going to determine the success of the challenge. "My weight as a player was around 11st 3lb, and I've not really packed on the pounds since retiring. My weight has dropped to about 10st 8lb at the moment." Benali spent almost 20 years at Southampton, only leaving once in 2001 for a short loan spell at Nottingham Forest. 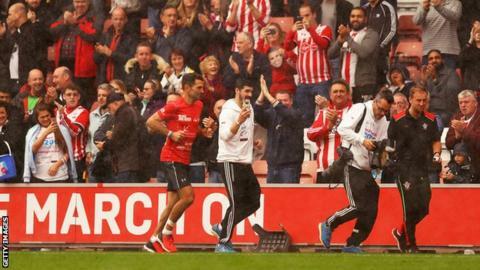 Footballers have to be incredibly fit, but as Benali has discovered, endurance running requires a whole lot more. "If I were to go out and play a football game now, the explosive speed and power I once had is no longer there," Benali says. "But my endurance has gone on to another level and that is result of all the training and challenges that I have done in recent years. It's well beyond what it was as a footballer." As is the case with many players post-retirement, Benali struggled for a focus after hanging up his boots. Since then, he has dabbled in coaching, media work and public speaking, but it is endurance challenges that have brought out his best. "While you're in football, you've always got that goal of working towards the game, there's always an aim to work towards," he says. "After retirement, I found it difficult to just go to the gym or go for a run in order to keep fit without having a real goal. "It focuses your efforts when you've got something to work towards." Running long distances is undeniably gruelling. That's before you add in a bike ride and a swim - especially when it pushes you out of your comfort zone. At 50, it's even harder, but Benali has promised his family this will be his final challenge. Or at least, his final big one. "The body is quite uncomfortable at the moment, lots of aches and pains all down to the schedule of my training," he says. "It's very much about getting your mindset and your body accustomed to going out hour after hour, crashing the miles out whether that's running, on the bike or in the pool. "You've got to get comfortable with pain and the niggles you feel. I'm trying to get the hours and the distances in, just to get my body used to what is to come. "I hope my body will be in the best possible condition for when the challenge starts."